The Riverview Hunting Clubhouse is on the Southwest side of Sheldons Grove, on Route 100 on the North side of the highway. The clubhouse has a burgundy roof, cedar siding, and white rock driveway and parking lot. Take Highway 136 across the Illinois River to Route 100 South to the left. 15 miles to Sheldons Grove. Continue through Sheldons Grove and we are on your right hand side. Route 67 across IL River to Route 100 North intersection turn right 20 miles to Sheldons Grove Just before Sheldons Grove we are on your left hand side. Drive East out of Macomb on Route 136 and follow the highway to Table Grove. Turn right and head South on Vermont Blacktop. Drive through Vermont staying on Main Street and head South out of Vermont until you reach Route 24. At Route 24 turn left (East) on Route 24 and drive into Astoria. About 2/3 through Astoria turn right at Grace Bible Church on South Green Street. Proceed 6.5 miles and follow the road to Sheldon's Grove Road and Route 100. Turn right (West) and proceed a little less than a .25 mile, turn at the gravel driveway on the right hand side. 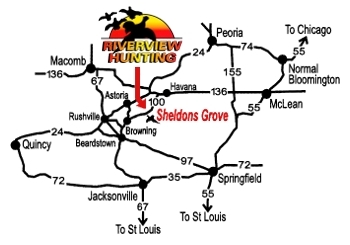 If using MapQuest then use Sheldons Grove as your destination, not Riverview Hunting, in order to get a correct map. Google Street View has an excellent view of the Clubhouse and driveway off Route 100. If you have further questions about the maps and directions please call us.